So I have finally gone and done it and it still almost doesn’t feel real! I have decided to set up a blog so that I have a diary of my trip and so that people can keep up with what I’m up too… Plus selfishly to reduce the amount of email text I will need to write! I had wanted to visit South America for about 10 years now. Due to a significant change in personal circumstances and receiving some inheritance money from my grandmother, my dream trip was all of a sudden within grasp. It’s never easy to lose someone and I have lost too people from my life in the last few years. People close to me will know that the last 3 years have been pretty rubbish in Robyn world. Therefore, when I unexpectedly received the inheritance money from my wonderful grandmother I was torn between being sensible and buying a house, or going after an adventure. I decided that if I was having a conversation with her about it she would have told me to go for the adventure with that twinkly smile she always had. It is to her I owe this experience and for which I will be eternally grateful to her, I would like to think she would be proud of and excited by my trip. So I did it! Last September I booked the trip of a lifetime. The last few months have been fairly crazy with work. I have been away from home since last August and working long hours, so my departure date crept up on me unawares. Being a person who likes to be very organised and prepared (control freak me – never!) it has all been a bit of a strange experience. I flew out from Brisbane to Quito, Ecuador, on Wednesday morning and arrived in the middle of the night. On arrival I was met by my pre-booked transfer guy Oscar, who then had to tell me that someone else he was also collecting was delayed by over an hour so his friend was taking me instead… So I’m bundled into the back of a car with some random guy who speaks no Ingles and I am completely rubbish at Spanish… So that was an interesting start. I arrived at the hostel all safe and well and had never been so excited to brush my teeth in my life. This morning I woke up feeling the effects of the altitude, at 2850m in elevation, Quito is quite high. I had a killer headache and my heart was thumping away. I’m definitely glad I got a Diamox prescription as it made all the difference, I reckon I would have lost the day too my bed otherwise. Although I am now suffering from the, apparently extremely common side effect of tingling hands and feet. It’s all very bizarre and spacey feeling. So it’s not the arctic 12 degrees I was expecting, but it’s still fairly cold. Cold enough that my fingers are slightly numb whilst typing (although probably partly the Diamox too) and I actually wore my 800 count down jacket today. After a long lie in and a nice breakfast I ventured out to explore, as I have 2 free days before meeting my tour group (although two of them are just checking into the hostel as I type this ). I wondered around for a while just looking at the buildings. I have to assume that most travellers here don’t just go out wandering as I saw no other travellers around at all and attracted a LOT of attention. Being fair in colouring I had been forewarned but it was pretty full on to be honest. I walked down to a nice park with a small market and then headed over into the historical district where there are some pretty squares and where most of the older buildings and churches are. I stopped off in the Basilica which was nice. It has some great stained glass, I actually ended up staying there a little while. I always find churches extremely calming places to visit and found that being there was very nice as I was the only person and it and helped chill me out after feeling a bit on edge from my walk over there. I also visited the Campania de Jesus, which is quite small in size, but the interior if frankly insane! Everything is gilded in 23 carat gold, it’s so shiny. Some of the painting and carvings are amazing too. Feeling very touristy I stopped for an ice cream and managed to annoy the shop keeper. Apparently you are not allowed to take your ice cream out of the fridge yourself as they are kept locked up and I accidentally showed that the lock isn’t actually a proper lock – it’s just stuck onto the fridge lid – oops. I then found that I had walked to the far edge of the town and it was getting to the point where people were stopping to stare as I walked past again, so I hoped in a taxi home to the hostel. I had the friendliest taxi driver and actually managed a conversation in Spanish for a whole 10 minutes – amazing! Plus he only charged me half the fare on the meter, bonus! I’m hoping to visit Cotopaxi national park and the cloud Forrest’s over the next few days before heading into the Amazon, which I am extremely excited about. plus it will be warm there! 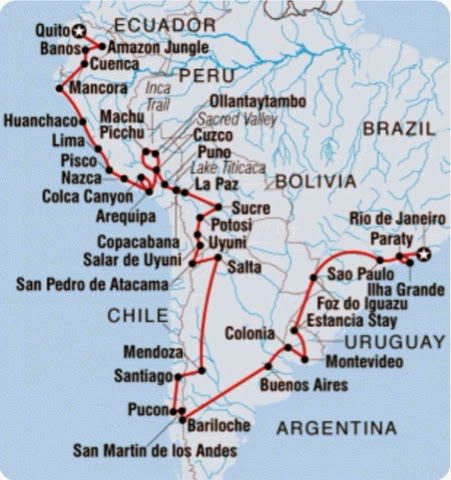 The route of my trip is shown outlined below… Hopefully you will follow and share in my journey over the coming months. This entry was posted in Travel and tagged Adventure, Argentina, Bolivia, Brasil, Brazil, Chile, Ecuador, Intrepid, New Ideas, Peru, South America, SouthAmericanAdventure, Travel. Bookmark the permalink.